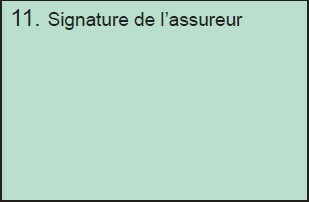 Country code: letter of the country of the Bureau under whose authority the Green Card was issued (France: F). Insurer’s code: code of the insurance company that issued the Green Card (three or four figures). Number: any number considered relevant by the insurer (usually the policy number). List of countries where you can travel without having to take out additional insurance: a Green Card issued by an EU Bureau must be provided for all EU countries and all other countries that have signed the multilateral agreement (your insurer [should not] strike out any of these countries but if another country’s box is crossed out this means that you will not have third party liability cover). After the eleven boxes is a space called “useful information” that can be used by your insurer to add any kind of additional information that s/he believes relevant for you (other useful services offered, advice on what to do in case of accident, etc. ).